Patrick was attempting to coach Serena, probably deserved a warning. Patrick was wrong. Serena over-reacted and breaking her racket was beneath her as was her temper tantrum after she received the penalty. Serena was wrong. The umpire went over-the-top with the game penalty because Serena called him a thief. If you're that thin-skinned you have no right to be an umpire and much worse is said to umpires every day without any repercussions. Umpire was wrong. Serena calling this sexism, is harmful to women. It minimizes what "sexism" actually is. There were two women on that court and for Serena to claim "sexism" is illogical and stupid. Serena was wrong. The US Open fans that booed Osaka are idiots. Osaka played a brilliant game, she is a big part of the future of Women's tennis and she deserved cheers and a standing ovation. US Open fans were wrong. Ya, I agree with all of this. But I will say it is a bit strange for the umpire to call a code violation for coaching when it is common for all coaches to do this (Toni Nadal doesn’t even try to hide it; Brad Gilbert brags about giving Agassi hand signals all the time). But on the other hand, once it’s called, I don’t agree with a player abusing the umpire for it. It is his discretion. Serena needs to just accept it, move on, and play the match. And I really don’t agree with the media backing Serena and basically encouraging players to do what she did when they disagree. That’s a terrible thing to be teaching to the young tennis players out there. Class politics and identity politics are two different things, and the latter is mainly a liberal concern. The American Constitution has been understood to exclude discrimination, but I'm sure you wish it were otherwise. Hence the obsession with the issue from your side. So please, don’t try and twist this into a “right wing” thing, because it clearly isn’t. He's now the target of a backlash from the Twitter feminists. Sadly, those people do not care for facts and logic. Good to know that I'm meaningless.. Sad if that's your only opinion. Serena has an attitude problem and she doesn't want to face it. She won't because she thinks she's a rock star, a diva, so rich and so famous that she can say, wear, do anything she pleases whenever and however she pleases. She justifies the escalation of her drama queen antics by playing the racism card (thankfully Osaka is non-white), the sexism card, the persecution card, the "I didn't know" card (really? After decades in the business?? ), anything rather than take personal responsibility for the way she behaves, the way she pushes the envelope, for acting entitled, using various intimidation techniques and expecting to get away with them. Somebody has to put her back in her place for the good of the sport in general and set firm limits. Somebody has to let her know that she may be a billionaire and a superstar but in the context of tennis, she is just an athlete, a competing athlete that needs to obey rules, follow the guidelines and treat umps, linespeople, with a modicum of respect, leave the superhero ego in the locker room because this is not what the sport of tennis is about. The ump stood his ground and that's what Serena needs because her hubris is so oversized at this point. It's: me, me, me me and no the ump is not the boss, I am. Well , Serena, sometimes tough love is the best thing there is so, no, you are not the boss and you did get coached and you knew the rule about racquet abuse and after 2 code violations, you knew the 3rd one was game penalty. 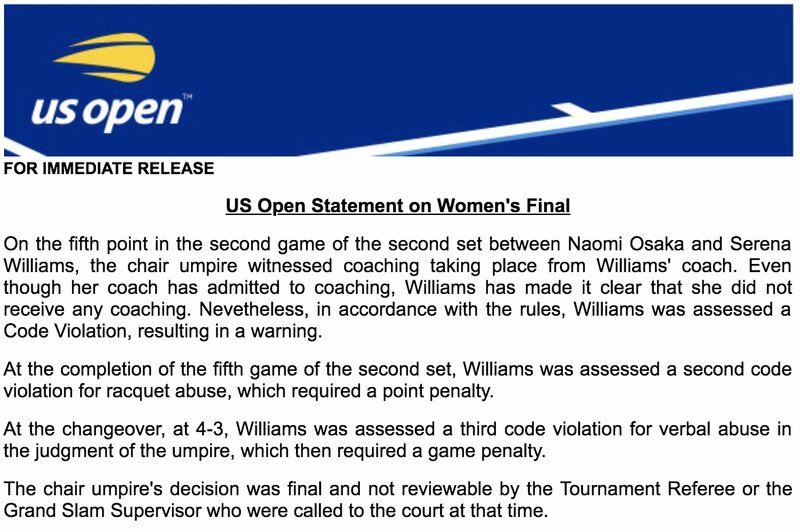 So when you started bullying the ump verbally and physically (finger wagging and other shenanigans vaguely reminiscent of the Clijsters line judge incident), you knew what was coming next. And I know I should not mix politics into all this but at a time in the history of the US when the sitting president embodies the legitimization of bullying and intimidation over common sense, we need American athletes to reflect different values, even opposite values, more than ever before. I almost forgot: Osaka played the perfect match. She didn't even lose focus after the long interruption and all the drama and that's the only thing we should be talking about tonight of course. Never has the moment for a first-time slam winner been so destroyed. Thing is that she had two previous warnings, so the abuse deserved another warning, and this time was a game. It is not like Ramos can choose what punishment should be applied, she played with fire knowing he had two warnings and got burned. So basically you said that BECAUSE other umpired DO NOT enforce rules in the book, then this is bad umpiring. Nice try, but sorry, not this time. You're right about Roddick and Mac, though I feel like umpires are tougher in the last few years. Maybe it is just her. But that is still inappropriate bias, no? I think it is gender-based. There are several current male players who are more volatile (Fognini, Kgyrios). I can’t think of any women who do these things, so our sample is small. But the treatment of those guys versus Serena is pretty glaring. Also, I think it is unpersuasive to say that different umps exercise discretion differently. All umps at this level have the same training and policies they are to follow, so there should not be large discrepancies. I mean, if a police officer exercises her discretion and treats one person unfairly, it is not an appropriate response to say that other police officers aren’t treating people unfairly. Anyway, thank you for your thoughtful post. Maybe. But I also remember being told that America was a "melting pot". Meaning that wherever you came from you adopted American ways. Multicultural? Somewhat, but in the 1920s there were quotas over how many people could be accepted from different nations. Maybe that was wrong and how it is now is better, but historically, these things have not been Americas "ideals and values". I like the salad bowl concept. It just seems healthier. But multiculturalism might have some negatives. Yeah, we mos def have problems. We give those problems a ton of power these days. Only if we allow it.. Being dad is nothing comparable to being a non-cheating mom. You should be embarrassed of yourself. don't attack me, I have a daughter too. Or at least I know someone who has a daughter. Yeah the lineswoman should have swallowed the balls and commited suicide. Same for chair umpire eraki in 2011 final. What was it like hearing about that when it first broke? Man, I can only imagine; apparently McEnroe was playing some very good tennis up until Pernfors. I was 11 at the time so take this with a grain of salt (and Edberg is my favorite player ever): McEnroe had played very well in rounds 1 through 3, but he hadn't really been tested. He started fine against Pernfors but his temper fraying was partly because he was getting pushed harder than expected, with Pernfors winning set two and almost taking set three. And he went a break up in set four just before the default. The courts were also relatively slow and high bouncing. I'm not confident McEnroe would have got through the semi-final against Lendl, who played pretty well all tournament and especially well in the semi-final against Noah, winning 6-4 6-1 6-2 against someone who'd beaten him in the warmup in Sydney. Given that Edberg picked up an injury in the semis, no doubt McEnroe could have beaten him had they played in the final, but I'd be really surprised if a fit Edberg would have lost to him. I don't think a fit Edberg would have lost to Lendl, either. Even with the injury, he served for the second set at 6-4 6-5. Edberg was playing about as well as he ever played, so it's too bad for him he picked up the stomach injury. No umpire will ever give any of the Big 3 a game violation. Won't happen. I pretty much agree, and this is a huge problem. For whoever is interested, the blonde lady is WTA Supervisor Donna Kelso. Tour events all have a referee in charge of the tournament but they also have ATP and/or WTA supervisors that fill various roles. Brian Earley is the referee. I believe I read that this will be his last year as referee of the US Open. If I remember correctly, Earley and Kelso were also the two that came on the court during the foot fault incident. In baseball and heck in most pro team sports, heck even in lets say golf. A player breaks a bat nothing happens he breaks a freaking bat. Nothing happens to tiger woods when he smashes his four iron over his knee. Tennis needs to get out of the gilded age. This stuff is silly. Regardless of players knowing the rules. No hockey player gets a penalty for breaking his stick apart. This is all stupid. You don't give a warning to a player cause the coach is off his rocker. She or he can't control them. They are playing a game. It leads to dumb crap like this. I agree rules are often silly, I'm also fine with players breaking rackets and I'd be fine with allowing on court coaching in tennis. Once it is currently not allowed, as soon as one coach does it, the player can benefit from it even if the coach's behavior is not under his/her control, so as long as on court coaching isn't allowed it is unfair to the players/coaches who abide to the rules when those who don't do not get punished. Look, if you make clear to an umpire that you have the power to ban him from officiating any match you are going to participate, sorry but for me that means abuse, definitely. But really that was not the only thing that happened - add Serena's calling him "liar" and "thief" in a very loud voice, for me in a glance definitely deserves a warning for verbal abuse. What do you need to call that? Do you want another US Open 2009 episode? The booing at the ceremony is crossing the line. Osaka is also American, with dual citizenship. She's been here since she was 3. This was not as bad as telling a chair umpire she is an ugly person on the inside. Remember that one? Tonight, she was pointing at ramos, and demanding an apology. He could have risen above it. He did for a bit, coolly. But then, later, he chose not to take it. Not sure if this press is good for the game? Or just embarrassing. I am a parent! And i have been playing, coaching, watching, and enjoying tennis for over four decades! I demand an apology! Where is my apology?! It's a fiasco, sure enough, with several authors none of whom was Osaka. Considering that an abusive tantrum cost her the semifinal at the same tourney several years ago, the irony was priceless. As for Osaka, what a great humble and likeable champion! Wait, are you sayin' that she's been here for yeaz? Yea like I said Tennis sort of sets itself up for this controversy. Puts the refs and players in bad positions. Actually everyone. If a coach can't coach then put him up in a luxury box. If he can then let him coach. You are putting the refs into a position they don't need to be put in. You are putting everyone into a position they don't need to be put in. Funny how the truth is always an excuse. Of all the coaching that was going on in the last two weeks, it didnt get called until the final in which Serena was playing. Do you have videos or examples of the coaching that was happening? Did you actually see it or are you just assuming that it was happening? "We" have nothing to do with it. It should have been the happiest moment of Osaka's young tennis career, but instead she was fighting back sad tears. Yes. But Williams represented the US. If Osaka wins, a Japanese player wins. If Williams wins, an American player wins. Maybe it's not so clear. Matter of factly pointing to middle ground being correct is no different then choosing any extreme position. I referred to them in another thread as unschooled drunken hyenas, but I'm content to declare both labels as appropriate. I literally don’t care about sides. It’s not “my side”. We’re talking about identity politics right now. You’re trying to fight over nothing, seeing as you just admitted that I’m correct. The centre and the majority of modern conservatives really don’t care about your race, gender or sexuality (unless you’re trying to compel speech by legally forcing someone to use your made-up pronouns). The left existence is solely committed to the division and discrimination of people based on which “category” they are pigeonholed into. You just admitted to it. I expected them to stand behind Ramos and that his exercise of discretion was appropriate. They were silent about that. She uses a Yonex, which is cool. Japanese company. Serena uses a wilson. Originally from Chicago, established in 1914, but now wilson is Owned by Amer Sports, from Finland. So basically, Serena is Finnish!? Nah, she will keep winning slams until she kicks margaret smith court to the dirt. Figuratively. Or lidrelly. Y'all need to make an announcement that serena did not get coaching. You owe her an apology!! If you dislike a certain player, I'm sure it was fun. abmk, or another resident historian - when was this last enforced? Do you mean the game penalty? I have never seen that, I don't think. Definitely not in a match of any note. But the rest of it occurs pretty much every match. Nick Kyrgios gets warnings and point penalties frequently. It really doesn't, even after having watched McEnroe for years, I was astonished at his behavior. He was unhinged. Damn that man could throw an epic tantrum. I miss him. how many times does this biotch get to act a fool at a grand slam? enough is enough. ban this mofo from tennis altogether. remember that incident years back where she was basically threatening some 68 year old lineslady about a footfault call. fugly girl got her upcommenz. bout time. thank you mr. ramos for saving tennis. There were two Americans in the final today! Apart from that, the crowd was booing the controversy not the players. Trying to force someone to apologize to you never turns out well. It's funny when she says "You're going to take this away from me because I am a woman??". It's the woman's final, it's not like he's letting a man win it. Osaka is a woman too you know. to be honest with you, the elephant in the room is that serena actually looks like a .... fugly fugly man. What a joke of a thread. Get outta here with your woman cards and your myths and take some freaking responsibility for your actions. Yes, and she was not even disqualified LOL or even suspended. Just a fine and that was it. So, tell me, that in your book was OK? I can accept that verbal abuse is a bit subjective - now, if you are the authority and receive that kind of treatment from a player, would you let it go only for the (allegedly) good of the match? Not anymore, she won't. Oksona is too good. How is telling the umpire they won't umpire another of their games again, on the same level of threatening to kill someone. I mean come on, you don't really equate those two, do you?